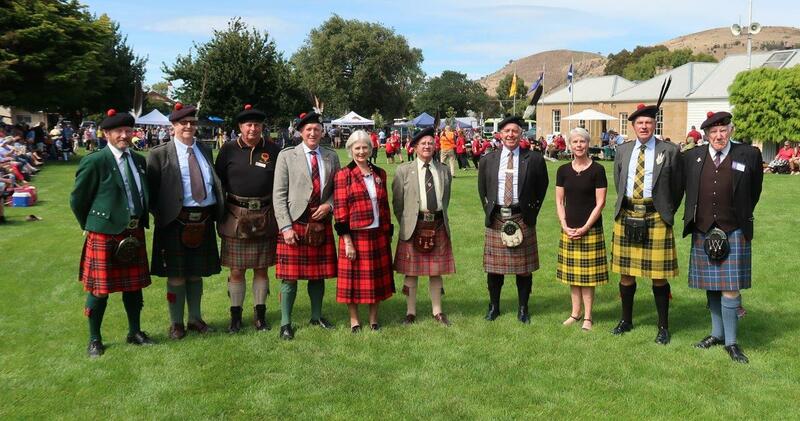 The Richmond Village Green Tasmania, will be turned Scottish on Sunday, 17 February 2019. All the action runs from 10am - 4pm. 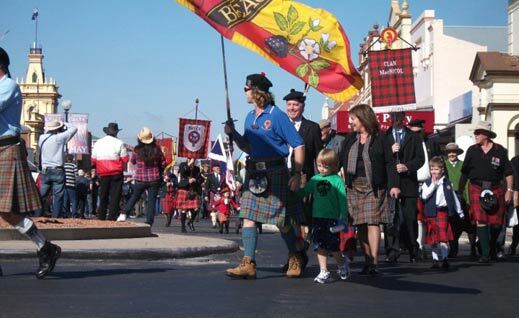 Come and join us for a day of all things Scottish including Highland dancing competitions, Scottish Country dancing displays, Pipe Band displays and competitions, and Scottish stalls and much more!. 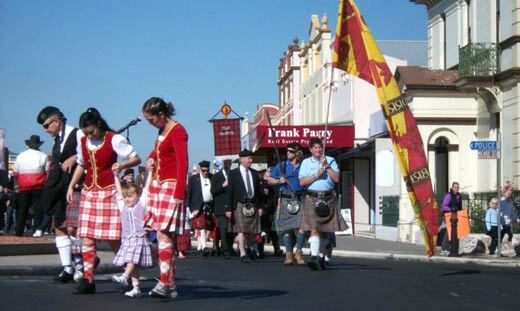 Bring the family down to the Village Green and wander around and also check out the beautiful Tasmanian town of Richmond too! 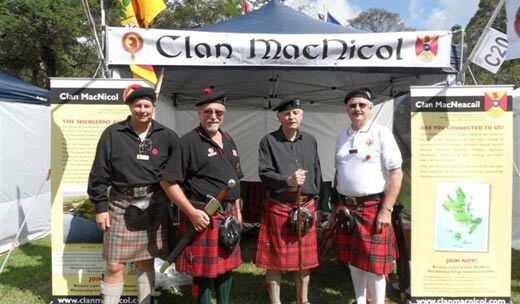 Clan MacNicol will be there ALSO our Chief John MacNeacail of MacNeacail and Scorrybreac. So call in and say hello, stay and enjoy the day! 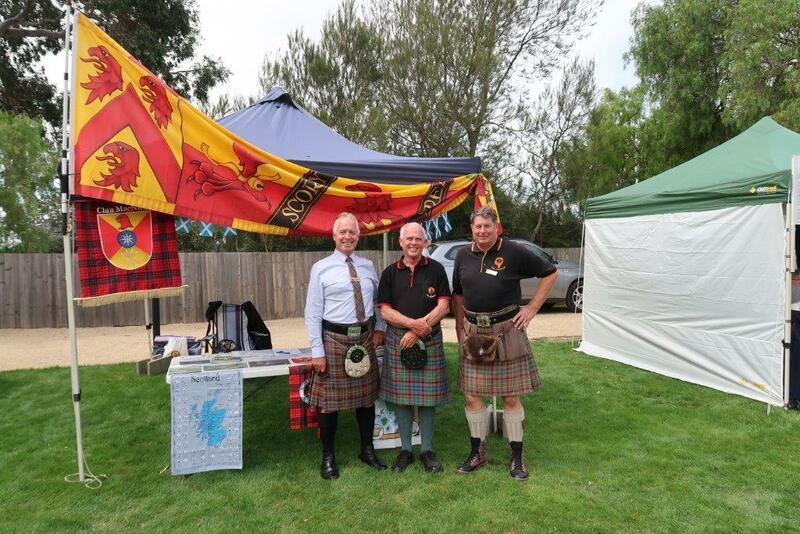 You'll be welcomed to the Gathering by the Clan MacNeacail Society of Scotland Chairman, Donnie Nicolson. During the evening you will have the opportunity to buy tickets for the various events, there is no need to pre-book. 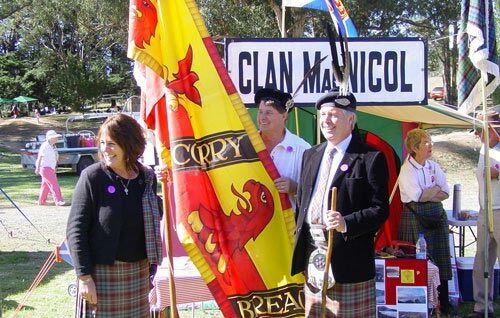 Our Chief John MacNeacail of MacNeacail and Scorrybreac will raise his standard on the Clan land overlooking Portree. 2pm-3.30pm - Scorrybreac work party - An opportunity to get your hands dirty and carry out some maintenance on our land. For those that don't feel up to the work party, your more that welcome to just join the group and spend some time on the land and enjoy a bit of craic! 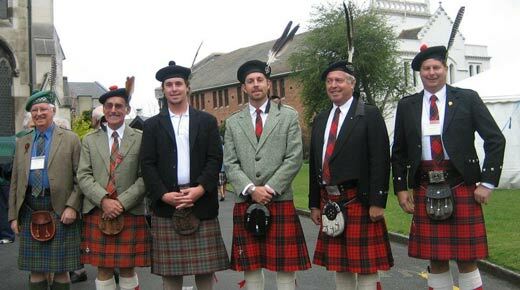 "Craic" Scottish term meaning - fun, entertaining and enjoyable conversation. Music by the James Stewart Trio - James Stewart on piano accordion, his father Sam Stewart on second box and Donald John Campbell on drums. Sligachan Hotel which renowned for it's impressive collection of over 400 malts from every pocket of Scotland, the full gantry will please those who wish to sample some of Scotland's 'Uisge Beatha' (water of life). Proof of the bar's popularity lies it's title of 'WHISKY BAR OF THE YEAR', which it has maintained for four consecutive years. Dinner will be followed by a ceilidh dance. Transport provided from Portree which is 9miles away. 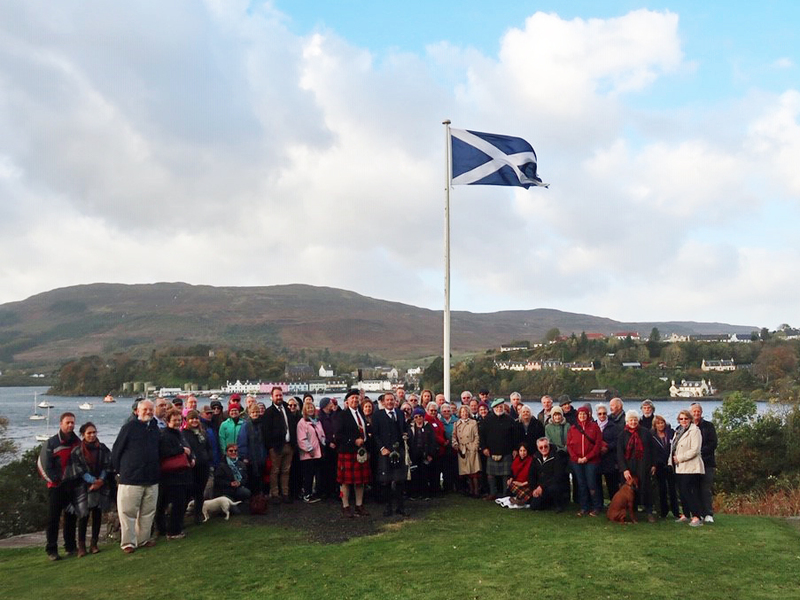 2.45pm A visit to Saint Columba's Isle accompanied by a lone piper. 7.00pm - Royal Hotel - Portree. A meal of haggis neaps and tatties followed by an evening of accordion music, ceilidh dancing, gaelic song, Highland dancers, and bagpipes. Friday 3pm and Saturday 11am - Walks can be booked at the Welcome Reception - £5 per person. Portree is a bustling fishing town with painted buildings huddled round the harbour. It is the main town on Skye with a population of 3000 people. Starting at the Skye Gathering Hall in Portree, Catriona your local guide will explain some of the history of Portree. During the 1.5/2hr (2 mile) walk, you will discover some of the secrets of Portree. 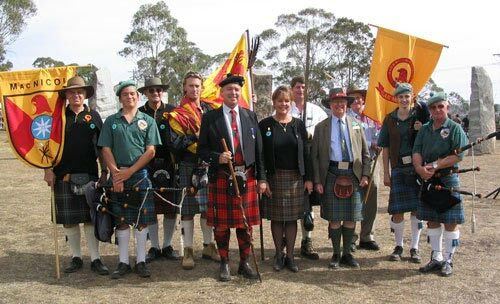 You will make our way up to the natural amphitheatre, known locally as the Lump, which is the site for the Highland Games, held here since 1877. The apothecary’s tower provides glorious 360 views which include the Cuillin Mountains to the south and the rock formation known as the Old Man of Storr in the north. During the walk, you will see views across the Harbour to the Clan Nicolson land at Scorrybreac. At the corner of the path you come to Battery Point, so-named because there was a gun emplacement here to protect Loch Portree during the Napoleonic Wars. This area of the Scorrybreac lands was the favorite view of Pam MacNeacail, the wife of our late Chief, Iain MacNeacail. You will then return to the Square in Portree on the same path. Your Guide will provide lots of information about Portree, Skye and the Clan Nicolson. Boat Trips (optional)to book contact each company directly. There are various boat trips that operate out of Portree Harbour, we recommend the following. More information will be added in due course plus pricing. All events can be booked and paid for at the welcome drinks. Please note that visiting Skye in October there will be the 'slight' chance of rain, so please bring appropriate clothing for the events that take place outdoors. We're delighted to announce that the circular path at Scorrybreac is now open. 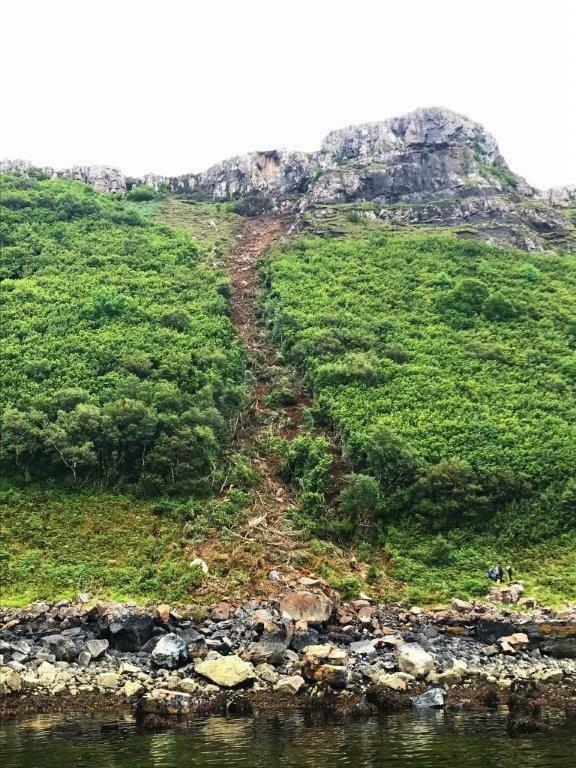 For the last week an abseil team has been working to clear the last of the rock that was in a precarious position since the rockslide. The path itself will need a little work in the future, but is easily passable with care. Thanks to all who offered to help, to the abseil team and to the general public for their patience while we dealt with the situation.